Sample and solve your toughest analytical challenges with minimal time investment — and often with only one click. The Thermo Scientific™ Nicolet™ iS™10 FT-IR Spectrometer offers the highest confidence in materials identification and verification. Just load your sample, generate the spectrum and press print. Designed for rugged, precise and fast-paced operation, the Nicolet iS10 FT-IR Spectrometer simplifies laboratory data collection, combining advanced technology with easy operation for quality performance across technicians of any skill level. Ordering Information: This FT-IR spectrometer is sold as a configured system designed to meet your specific application needs. 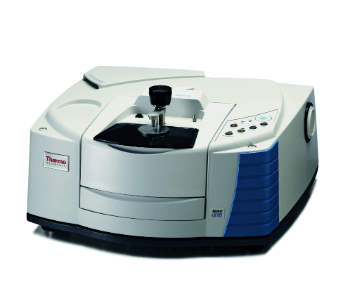 For more information, contact your Thermo Scientific™ Sales Representative. The Nicolet iS10 FT-IR spectrometer is a complete infrared spectroscopy system for routine analytical needs. The Nicolet iS10 delivers the highest confidence in the verification and identification of materials.